There are currently 24 species of bumblebee resident in Britain. Another, the Short-haired bumblebee (Bombus subterraneus), is currently being reintroduced after going extinct in 1988. Britain also has two extinct bumblebee species: Cullum’s bumblebee (Bombus cullumanus) last recorded on the Berkshire Downs in 1941, and the Apple bumblebee (Bombus pomorum), a short-lived establishment on the south coast in the mid-1800s. The Heath bumblebee (Bombus jonellus) sometimes joins the group above, to form a ‘Big 8’, although it is absent from much of the English Midlands. 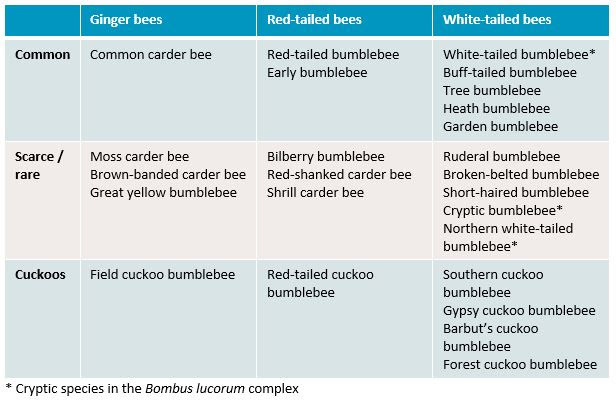 There are 8 bumblebee species listed on at least one of the English, Welsh and Scottish conservation priority species lists. Many of these are endemic species which can be abundant in small areas. Others are more widespread, but at a very low population density. 18 species are social species. They make nests, collect pollen and have a worker caste. The remaining six species have a parasitic lifestyle, taking over existing nests established by other species. These species are known as ‘cuckoo’ bumblebees and don’t have workers, just queens and males. They tend to be widespread but only at a comparatively low abundance. There are many other flying insects which resemble bumblebees! Sometimes these are deliberate mimics (such as the hoverfly (Volucella bombylans)), exploiting their predator’s reluctance to take on something which could fight back. Some look similar because they are closely related to bumblebees (such as the Hairy-footed flower bee (Anthophora plumipes)), and sometimes it’s just convergent evolution (for instance the spring-flying parasitic fly (Tachina ursina)), where the traits that help bumblebees thrive (large size, bulky shape, hair, etc.) also favour the survival of other species. Usually, it is relatively easily to recognise the mimic species. Bumblebees are bigger, hairier and fly more deliberately with a lower-pitched buzz than most of the similar fly species. However, sometimes the mimics can be very similar to bumblebees, and short of examining a specimen the best way to separate the groups is to examine the heads. Bumblebees have long, multi-section tubular antennae, long tubular mouthparts (though these are often folded up), and relatively small eyes.